It might be over three months since I had the pleasure of seeing Bruce Springsteen but the time has finally come to put into words how awesome the night was. For as long as I can remember I never thought Bruce Springsteen would come back to Australia. When combining his disaster tour of 2003 with the fact the man turns 64 in a few months, it was hard to see him making the trip to this side of the globe. When the announcement was made at the end of November last year that he was making the trip down for a series of shows on the East Coast it was a case of getting tickets at whatever cost, which I managed without a great deal of stress thanks to the wonder that is pre-sale. The day finally arrived, and the excitement I felt was increased by the fact the concert came a day after another anniversary celebration with S, who would be accompanying me that night. I’m sure if you asked her I probably checked the time once every two minutes to see if we needed to start getting ready yet. 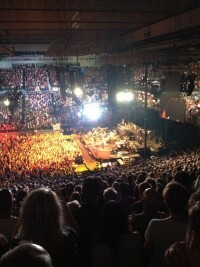 Once we were seated inside Rod Laver Arena, the anticipation grew as the crowd filled with the show slated to start at 7pm. The moment of reckoning came and went, and the applause was thunderous as he hit the stage at just after 7.45. I’d spoken to several people before the show who had seen him at other shows on the tour so I was fortunate that I knew what to expect, and if there was ever a case of somebody delivering what they promised this was it. It was almost like a scene from a movie for the entire night as it felt like I had floated into a magical place where everything went as planned and even if there was a hitch it certainly wasn’t noticeable. Musically there were several highlights for me (Set list below) with Hungry Heart being the first indication of the energy he could draw from the crowd, and from there it didn’t diminish. I’d heard great things about the Ghost of Tom Joad, thanks in part to Tom Morello of Rage Against The Machine, who was filling in for Miami Steve who couldn’t tour due to previous commitments. With the Ghost of Tom Joad being widely renowned as one of, if not the worst album he had released my expectations weren’t exactly high, despite this conflicting what I’d heard.How wrong I was. Tom Morello (who had been outstanding on guitar all night) brought enough of a vocal change to this rock-paced ballad to ensure that it left the crowd rocking. In one of the many conversations I had with S after the show she remarked how incredible it was that he was still producing such great music at his age, something which her favourite track of the night (Death To My Hometown) is the perfect example of. Many know of the emotion that goes into the words written by Springsteen, but the moment of the night for me (and many others I assume) came during Tenth Avenue Freeze-Out in the third verse, when the venue fell silent as pictures of The Big Man filled the big screen, which were in turn met with deafening applause. Not only is that a great show of unity from Bruce, but also a show of strength from Jake Clemons who is on the Sax on the current tour, as I can’t imagine how tough it must be for him to see the tribute to his uncle night after night. I said it multiple times that night and have said it multiple times since, I really hope I’m that healthy when I hit 63. If there was ever a way to capture the night in one statement it was the following which came from the official tour program. That loyalty and bond Bruce shares with each member of the touring party whatever role they play, made it a truly remarkable experience which I’ll treasure forever. This entry was posted in Tunes and tagged Bruce Springsteen, Jake Clemons, Melbourne, Music, The Big Man, The Boss. Bookmark the permalink. I love you too, sweetie, and it was so amazing to be caught up in your enthusiasm. I had a wonderful time. Looking forward to the next show!